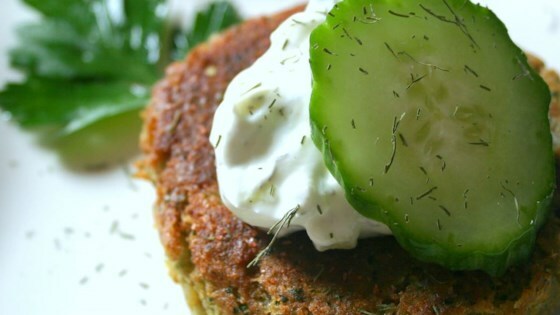 "This is a great recipe for falafel. Everyone that I have made it for loves it. Yum!" In a large bowl mash chickpeas until thick and pasty; don't use a blender, as the consistency will be too thin. In a blender, process onion, parsley and garlic until smooth. Stir into mashed chickpeas. Heat 1 inch of oil in a large skillet over medium-high heat. Fry patties in hot oil until brown on both sides. Serve two falafels in each pita half topped with chopped tomatoes and cucumber sauce. Simple and quick recipe to prepare that delivers lots of Mediterranean flavors.